At 92 years old, ex-Malaysian prime minister, Tun Mahathir Mohamad, will be the country’s oldest Member of Parliament should he win at the next general election. But he might not be the oldest candidate to stand in the upcoming Malaysian polls. 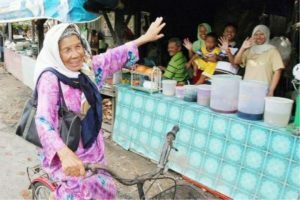 Madam Maimun Yusof, 99, stood and lost in both the 2008 and 2013 general election as an aspiring MP for the Kuala Terengganu parliament seat. She contested as an independent, using in 2013 the symbol of three keys, signifying Peninsular Malaysia’s three main ethnic groups. She said she will contest again if she could get the minimum RM10,000 (S$3,350) election deposit required by the Election Commission. Malaysia is expected to go to the polls in the first half of the year. Asked in 2013 by Malaysiakini news site why she wanted to contest, the grandmother said: “It is a sin to remain silent when you see people committing wrongdoings. Nothing would happen if you just shout about it by the roadside. “They want to sell our state to outsiders but Tok does not want them to sell,” she added. Madam Maimun had claimed that Parti Islam SeMalaysia, which ruled Terengganu for five years following the 1999 polls, wanted to “sell Terengganu to the Japanese” because its logo of a white moon, is similar to the red circle at the centre of the Japanese flag. She lost her deposit in both the 2008 and 2013 polls, getting just 685 and 182 votes, respectively, out of the more than 60,000 voters. But she gained a lot of media attention in both elections, with pictures of her riding her campaign bicycle widely splashed in the newspapers. Dr. Mahathir, who is the de-facto opposition chief, has said he is likely to stand in the Langkawi or Kubang Pasu parliamentary wards, both in Kedah state, or in the Putrajaya seat.